CUKAT 2018 Central University of Kashmir offers Integrated programme and Language Courses to the students. The Application Process for the academic session 2018-19 for Integrated B.A. LLB has been started and the last date to apply for the admission to the CUKAT 2018 for Integrated B.A. LLB is 24 March 2018 and the Exam will be conducted on 1 April 2018 for the same. The Central University of Kashmir (formerly known as the Central University of Jammu and Kashmir) was established in March 2009. It is one of the 13 newly established central universities in different states of India by the Central Universities Act, 2009. 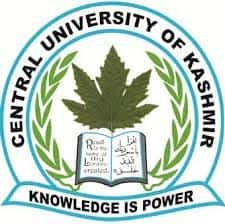 Till 2016 the Central University of Kashmir admitted students based on CUCET, but from past year the University has decided to conduct their exam that is CUKAT for admission into the Integrated Courses. Latest Update: CUKAT 2018 Integrated B.A. LLB application process has been started. Candidate can fill the online application form here by following the link by 24 March 2018. The Central University of Kashmir is one of the nine central universities taking CUKAT score for admission to its various 5 Year Integrated Programmes and Language Programmes in Central University of Kashmir is listed below. The Central University of Kashmir will also offer admission based on CUCET 2018 apart from CUKAT. Candidate must have passed 10+2 examination or equivalent. Candidates appearing for the final examinations are also eligible. 10+2 in any stream with at least 50% marks or its equivalent on Grading Scale of respective Boards/Universities (45% for SC/ST/OBC/PWD candidates). With Mathematics and Physics as main subjects. Candidates must have English Literature as one of the subject/English Hons. Candidates must have Urdu as one of the subjects. To how many courses a student can apply to through CUKAT? Eligible students can apply for up to 3 (three) options of programmes/courses of his/her choice. But care should be taken to ensure that you apply only for those programmes/courses for which you are eligible. The candidates can apply for CUKAT 2018 online for B.A. LLB now. There is no offline Process of filling the CUKAT 2018 Application Form. The application process for the CUKAT 2018 can be filled online only. The application process for the B.A. LLB Integrated courses has been started, the candidate can fill their application form by following the link given below. Online Mode: Candidates may apply through online mode by visiting the official website. The application fees can be paid via SBI Bank Challan or through Credit/Debit Card. Follow the link given below to apply online for CUKAT 2018. Submission of Application Form: On submission of online application successfully, applicants can make the payment for their selected programme by online or offline mode of payment. A candidate may fill the application form partially and login again to complete it as early as possible. Candidates will receive SMSs and Email alerts at the time of registration and completing registration. There are two modes of payment Offline and Online. Click on "Generate Bank Challan". After clicking, the system will generate an SBI Challan with auto-populated details of the applicant. There will be two copies of Challan - Applicant's copy and Bank's copy. Candidates are supposed to take a print out of this Challan. Now candidates will have to visit any SBI branch along with the printout of the Challan to make the payment of the amount mentioned on Challan. After making the payment in any SBI branch, candidates are supposed to obtain the Applicant's Copy of the Fee Payment Challan duly received by the Bank with (a) Branch Name & Code Number (b) Transaction ID/Journal No & (c) Date of Deposit filled by the Branch Official. This applicant's copy of SBI Bank Challan along with bank seal is a very important document for all the applicants, and all the applicants are advised to keep it safe. On successful submission of duly filled in CUKAT 2018 Application Form, an e-mail and SMS will be sent to the mail id & mobile number you have given in the application form. Candidates are required to keep a copy of the confirmation page of the CUKAT Application Form with them for the future references. Candidates will have to download the Hall Ticket on 27 March 2018 for Integrated B.A. LLB from the website by entering application number & date of birth. Candidates will be intimated about the same by Email/SMS alerts. An intimation or Hall Ticket will NOT be sent by post. The candidate has to follow the link given below to download the CUKAT Admit Card 2018 from the link below. Kindly Note: If a candidate pays the examination fee through Offline Challan mode of SBI, the bank charges of Rs 50 will be borne by the candidate. Common fee Structure: There is Fee common to all the programmes like admission fee, tuition fee, examination fee, library fee, sports, Internet charges, medical insurance, student Aid Fund, Library Security deposit etc. given below in the table. CUKAT Result 2018 for integrated B.A. LLB will be declared on 7 April 2018 for Integrated Law Entrance Examination held on 1 April 2018 at various examination centres across the country. The candidates appearing in the entrance examination, will be able to check their CUKAT Result 2018 here and the Selection List of the candidates on the official link given below. CUKAT 2018 would be conducted in offline mode(pen and paper mode). The question paper will consist of 100 Multiple Choice Questions and the total duration of the exam is 2 hours. There will also be a negative marking of (-1/4). There will be only one question paper comprising of 100 MCQs to be completed in 2 hours covering English language, reasoning, data interpretations/numerical ability, general awareness and analytical skills. This part consists of four sections with 25 Ques Each i.e. Note: Part B comprising 25 questions each subject and candidates must attempt questions from Section I (Physics) & II (Chemistry) and from only one section either Mathematics (Section III) or Biology (Section IV). While appearing in the CUKAT 2018 Exam Candidates must ensure that they have read the syllabus and the Model test papers carefully to get the idea about the Entrance Exam. Candidates can download the CUKAT Syllabus for both Integrated Law and Integrated BSc-MSc Programmes in the link given below. Model Test Papers are also available for the candidates for all the 5 Integrated Programmes. The distribution of the seats in the CUKAT Integrated Programmes has been given below. The reservation policy as per the norms of the Indian Government is applicable to their given below seats.